Price – the price range. It reflects the price of the last trade as well as the amount, direction, price, and balance of an open position. Average volume - a ratio of the volume to the number of applications (depending on whether the Data Feed transmits data on the number of applications). Applications at the price levels that are not included in the DOM depth can also be displayed in this column by activating the Show Inactive Levels option. Average volume - a ratio of the volume of orders to their number (depending on whether the Data Feed transmits data on the number of orders s). Similar to the Bids column, applications at the price levels that are not included in the DOM depth can be displayed in this column by activating the Show Inactive Levels option. My orders - indicates all your current buy and/or sell limit and stop orders. My buy orders - indicates all your current buy limit and stop orders. My sell orders - indicates all your current sell limit and stop orders. Queue - displays the volume of queued-up orders. IMPORTANT: since the exchange does not provide data for the queued orders, this column is only an emulator that displays the queue, i.e., the data in this column are approximate and we cannot guarantee that your order will not be executed sooner or after the queue reaches zero. Volume profile - indicates data about the traded volume, the number of ticks, and the volume of the market buys or sells. Data can be displayed as a histogram and/or numbers. Trades - this option indicates data about the traded volume, the number of trades as well as bids, asks, delta trades and the open interest. A different period of time can be set. Open interest - the number of open positions on futures contracts (futures or options). In the real-time mode, open interest is broadcast to the Russian market only; for foreign exchanges, it cannot be displayed due to peculiarities of trading in these markets. Above-ask trades– trades at the price above BestAsk that preceded this trade; in fact, this can occur at slippage when a trade is executed at the expense of limit orders at different price levels. Below-bid trades– trades that took place at a price below BestBid that preceded this trade; in fact, this can occur at slippage when a trade is executed at the expense of limit orders at different price levels. We had a bid priced at 100, where 10 lots were traded. The value 10 is written into the column and begins to accumulate. Then the bid began trading at 101; the data on the price of 100 do not change; the values for the price of 101 are recorded and also accumulate. If the bid price returns back to 100, the data for the price of 100 will be erased while the value for the price of 101 will remain. But there is an exception: if the bid returns to the previous price (in this example, the price of 100) in less than 2.5 seconds, the data will not be cleared. The clearing interval can be adjusted in the column settings. Sell current trades - this option indicates the current trades to sell. The self-clearing algorithm is similar to the algorithm in the Buy current trades column. 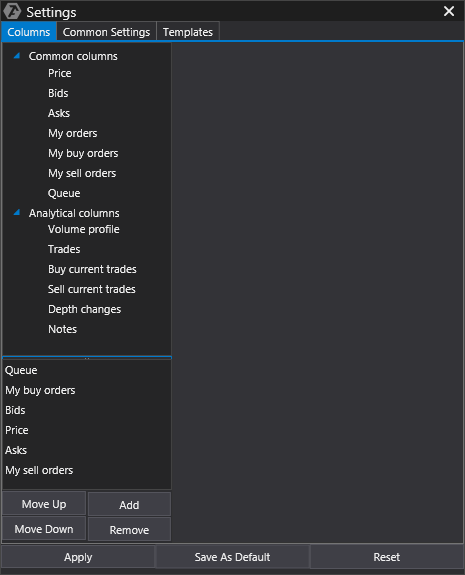 * Clear the Buy current trades columns manually by clicking on the X at the bottom of the column. Depth changes - this column provides detailed information about cancelations and adding limit orders. It shows the change in limit orders at each price level. The auto-clearing option depends on the selected type: Change of bids or Change of asks.If the Change of bids type is set and the price of the best bid is change; all the data on bids will be erased. The procedure with asks is similar. And the final number is the amount of the last change. Notes –displaying arbitrary text for notes. To add the desired column, select it from the list on the tab and click Add or double-click on the column header. To customize the prioritization of columns, use the Move Up or Move Down buttons. To remove unnecessary columns, use the Remove button.